If you like us on Facebook or follow us on Twitter, you rock! As a regular, you’ve probably seen our “Travel Tip Tuesdays.” Not familiar with these little gems? No worries. Hopefully that means you’re out experiencing a cool new place to eat, stay or play. Given that the summer travel season is in full swing and I’m relaxing in style with my two favorite people on the planet (I’m talking to you, mom and dad) in Northwest Ohio, I thought I’d share some additional travel tips with you. Before I get to that, I know what you’re thinking: This guy could go anywhere, why is he such an unabashed Ohio guy? Because we can’t appreciate where we are or anticipate where we’re going, unless we respect where we’re from. That said, I’m a proud, sturdy son of Ohio. 4. Know what space you will need for air travel. Request a bulkhead seat in advance if you need more room for a wheelchair transfer or a service animal. Keep in mind that not all seats have those lovely movable armrests. When in doubt, ask! Individual airlines will most likely have their own policies in place, so there may or may not be an extra charge for requesting special seating. I have to give a shout-out to Southwest Airlines for their seating policy. Getting to pre-board is magnificent. Kudos Southwest. Oh, and for the record, I’m gonna pull a Matthew McConaughey and let you know that I’ve been flying Southwest long before anybody paid me to fly them – in fact, they *still* don’t. But I digress. I don’t fly Southwest to be cool. I don’t fly Southwest to make a statement. I just like it. Well, *alright, alright*. Well said Matthew, well said. This salute to Mr. McConaughey references his recent ad campaign for Lincoln. If you’re not familiar with this seminal work, click on the link and watch it now. It is, I promise you, comedy gold. As an owner of a Ford Flex, I’m down with the lux arm of the brand, but where in the hell is he going? Honestly, he looks like a guy who is still *finding himself* after a week at Burning Man. For the love of God Matthew, STOP DRIVING and get some sleep! This concludes the public service portion of my post. 3. Air travel time. Are you traveling across the country or to another country? Think about varying the lengths of your flights. Longer times in the air might not be ideal, especially if you’re not able to comfortably access the airplane’s toilets. *Sidebar: This is brutal. Why do you think I never take advantage of the free drink coupons from my favorite airline? Here’s a hint: it’s not because I don’t enjoy a cold beer or a finger of scotch. * Having shorter connecting flights might be better. If you are traveling to another country and a shorter flight just isn’t possible, plan ahead so your trip can be as comfortable as possible. And, of course, I saved the best tip for last. 1. Share your experiences on brettapproved. 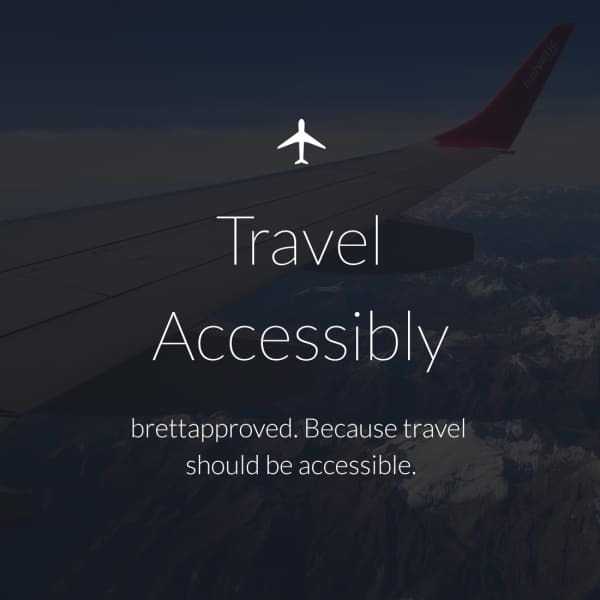 We built brettapproved with one goal in mind – to help ANYONE with a physical disability or mobility challenge travel confidently. Life is defined by experiences not stuff. So let’s get out there! Need proof? Just watch Matt’s spots again! But seriously, when you discover places that are accessible and you have a good experience, leave a review on brettapproved. It’s the best way to let our community know where we should stay, eat and play. Have a great summer and happy reviewing! Founder and CEO of brettapproved.com. Previous story Mary Taloff: Holy sh*t! I’m stranded in New Brunswick.